DALLAS, TX--(Marketwired - November 01, 2016) - Willow Bend Systems, a leading managed IT service provider dedicated to maximizing business performance for its customers, announced that it has published a guide examining the advantages and disadvantages of keeping IT services in house as opposed to contracting a managed services provider. 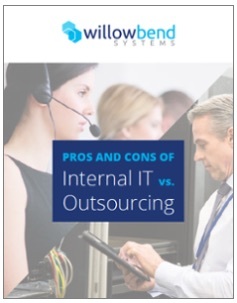 The e-book, Pros and Cons of Internal IT vs. Outsourcing, is available for free download at http://www.willowbendsystems.com/pros-and-cons-of-internal-it-vs-outsourcing. "Today's small businesses operate in a constantly changing and volatile business climate in which technology is a necessity rather than a luxury in order to be competitive," says Shayne Reich, President of Willow Bend Systems. "Whether they contract IT services or operate IT in house, business leaders and their workforce must be able to concentrate on running the business and not running technology in order to compete. Our new guide looks at the advantages of both approaches so that organizations can reach a decision that works best for them." For more information about this new e-book or Willow Bend's services, visit the company's website at www.willowbendsystems.com. Willow Bend Systems leverages your existing technology to develop IT solutions that work for your business. With managed IT services, infrastructure hosting, IT hardware sales, and IP phone systems, Willow Bend Systems delivers comprehensive, streamlined IT solutions that help you focus on your clients, not your technology. For more information, visit www.willowbendsystems.com.